Traditionally, minority students have been underrepresented in science, technology, engineering and mathematics (STEM) programs — and in the STEM marketplace. And as the U.S. innovation economy continues to grow, there comes an increasing requirement for skilled STEM workers to maintain the nation’s status as a global leader. However, a significant challenge for workforce diversity exists because of limited access of underrepresented populations to quality STEM education and opportunities for STEM employment. To try and overcome this challenge and ensure national competitiveness and sustained STEM global leadership, the Penn State Center for Nanotechnology Education and Utilization (CNEU), along with Norfolk State University (NSU) and Tidewater Community College (TCC), will form the Southeastern Coalition for Engagement and Exchange in Nanotechnology Education (SCENE) Louis Stokes Regional Center of Excellence in Broadening Participation. A total of $1.2 million in funding for this center was recently awarded by the National Science Foundation. SCENE will focus on increasing recruitment and retention of underrepresented minority (URM) undergraduate and graduate students at Historically Black Colleges and Universities (HBCU) and at community colleges with minority and underrepresented student enrollments. Recruitment efforts will be aimed at students studying STEM through nanoscience and nanotechnology education and engagement. Because nanotechnology embraces mathematics, physics, chemistry, biology, materials science and engineering, it has broad applications that highlight the impact of basic sciences and technologies. This provides an effective pathway to prepare URM students for modern challenges in research and development in STEM and to meet the demands of high-tech industries. 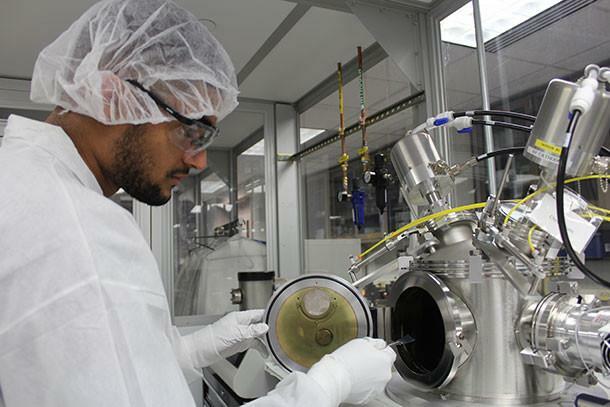 Through the CNEU-hosted Nanotechnology Applications and Career Knowledge (NACK) Network, students will have access to Remotely Accessible Instruments for Nanotechnology (RAIN), a service which provides web access to nanotechnology experts, online access and control of characterization and processing tools and cleanroom equipment in labs where cutting-edge research is being performed. RAIN will enable instructors to deliver authentic and relevant educational activities for students who normally wouldn’t have ready access to specialized facilities, tools and expertise required for the study of nanoscale science. SCENE will also develop its own program website that will provide a digital suite of interactive online learning and training modules adapted from CNEU’s extensive library of materials. Beyond conventional topics, the modules will address topics such as the origin of nanotechnology, its uniqueness, how it applies in modern society and what its potential is. These modules will also be added to existing courses at NSU and TCC, with an end goal of creating a nanotechnology certificate program for HBCUs. To provide valuable hands-on research opportunities, CNEU and NSU will host HBCU students in each of their state-of-the-art nanotechnology facilities for short durations, approximately one to two weeks. They will also look to implement a proposed seven-week summer internship program and workshops to increase students’ skills and knowledge. SCENE will also utilize partnering institutes, including NASA Langley Research Center, Jefferson National Research Laboratory Applied Research Center and Eastern Virginia Medical School, which are active members of the broader nanoscience and engineering community, to provide student-centered research opportunities. Through collaboration with NSF’s National Nanotechnology Coordinated Infrastructure, SCENE will extend its outreach to additional URM students. NNCI, with 16 user facility sites, not only provides access to URM students potentially interested in nanotechnology and STEM, but also to facilities to enhance nanotechnology education and hands-on experience. To further improve nanotechnology educational experiences for students, SCENE will provide professional development opportunities for educators and faculty at HBCUs and community colleges with predominately underrepresented minority enrollments. As the partnerships between the core institutions and partner institutes demonstrate effective strategies in broadening participation of underrepresented minority students in STEM education and in building a future workforce in high-tech industries, SCENE will continue to seek opportunities for network growth and extension of coalition in strategic and targeted ways to other HBCUs, colleges and industry and government research laboratories.